Despite visually appealing high-end design and security, the specialized Mac software is far from being a perfect tool for building websites. It offers a limited pack of HTML facilities needed for separate CSS files rather than having them in a single website. As a result, Mac users are looking for cloud-based and SaaS platforms and instruments instead of giving preference to traditional website building tools, which are developed for Mac and require preliminary installation. 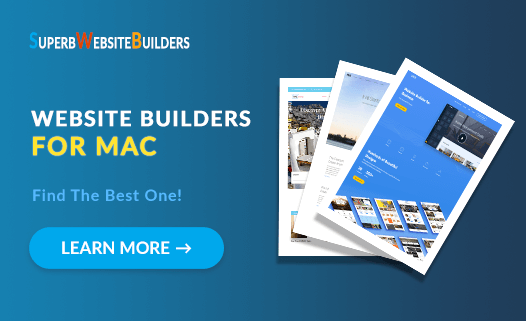 Website builders prove to be the right kind of tools Mac users can easily apply to create stunning web resources for different purposes from scratch. They don’t require serious effort and money investment, offering an extensive feature set instead. They are intuitive and simple for users with diverse web design background and do not require special skills, letting users effortlessly build decent web resources on their own. With a quality website builder, your project will have professional look and powerful functionality. Websites launched by Mac users are full-featured and come with appealing design. They are easy-to-manage and make it possible to provide all the content you wish to see in your website. This matters a lot for the fans of Mac web building software, who wish to save their effort and time, availing decent and full-featured websites created with a website builder. Website builders make it possible to launch projects, which are not worse (or sometimes even better) than those created by professional designers. They put a user in charge of the web development process, making it simpler to control each stage of it. These are only some of the benefits that make them stand out from the crowd. If you have made up your mind to look for a decent Mac web building software, then take your time to look through the reviews of the most popular and full-featured services listed in the post. Their comparison and list of highlights will simplify the choice for you. Let’s get started now. Wix – is the best website builder for Mac users, which makes it simple to create full-featured websites with stunning design. The system allows building different types of websites for personal and business use. It comes with out-of-the-box functionality, which is more than enough to cover a broad spectrum of versatile web design needs. • Mobile editor – Yes. The advanced Wix ADI tool will automatically build a website for you, using the submitted content. A convenient WYSIWYG website editor allows controlling each step of website customization process, fixing the problems on time. Apart from that, there is an opportunity to use a standard website editor and a mobile editor, if you have an intention to create a mobile version of your website. Wix also comes with hundreds of mobile-ready templates accessible via tablets and smartphones powered by iOS that are 100% customizable and intuitive in nature. Wix App Market is another advantage of the website builder. There are hundreds of free and paid widgets, extensions and apps available there your can integrate into your website to contribute to its usability. What’s more, the website builder comes with forum, blogging and eCommerce engines. This makes it possible to create, connect and manage a forum, a blog or an online store with no hassle at all. If you intend to launch and integrate applications into your website, you are welcome to use Wix Code for this purpose. This is a powerful web app builder, which doesn’t require coding skills (irrespective of the name of the tool), but allows creating functional applications for any type of website. Cost: You can use the system features at no cost at all, using its free plan that never expires. To bring your website functionality to the brand new level, though, you’ll have to upgrade to one of the paid plans, the cost of which starts with $4.5 for the cheapest plan and goes up to $24.5 per month for the most expensive subscription. uKit – is a simple and the most affordable website builder for Mac. The system is also a nice choice, if you intend to create other types of projects, but feel that you lack web design skills or time to handle complicated web building nuances. The service is cloud based and comes with a convenient drag-and-drop editor that contributes to the simplicity of the web building process. The website builder is known for its rich set of responsive templates, which fall into thematic categories and can be customized with regard to your needs. You can also browse a rich system gallery of premium-quality stock photos, download and integrate your own media files with a few clicks only. uKit widget collection is also impressive and lets you choose between the integrable extensions of high quality. uKit is SEO-friendly, which contributes to better promotion of websites launched with the system. Cost: The price of the cheapest plan constitutes $4 per month ($3/mo with SWB-25 promo code), while the cost of the most expensive subscription is $12 per month. The system allows testing its major features at no cost at all for 14-days by activating the trial version. Blocs – is a specialized website builder software for Mac, which can be a decent solution, if you need to create a catchy portfolio, attractive landing page or a website to promote products/services online. The website builder has a drag-and-drop option to handle easy editing. It comes with a high flexibility level and a pack of extra tools. The website builder offers a block and bricks structure. You just have to pick ready made content blocks and customize them as you need. The WYSIWYG page tool makes editing simple and fast. No coding skills or FTP manager are required to start a website with Blocs, but this triggers the need to look for an external hosting provider to upload and update the files when needed. Blocs doesn’t have a cloud dashboard to edit content. Instead, you will be offered a primary HTML-based website structure. To get a more complex project, you’ll have to customize your website with a CMS. This obviously requires coding skills and web design background. The system does not have integrated default templates as this is basically the app used to launch HTML-based themes on your own. The themes are developed by the application of stock editor tools. If this option does not appeal to you for some reason, you can get paid templates at the official website of the service (the cost of one theme constitutes $20). Cost: Blocs has a free downloadable trial version and two paid license types, the cost of which constitutes $80 and $360 correspondingly. Apart from that, you’ll have to pay around $100 per year for the hosting and about $60 for an opportunity to switch from the old website version of the service to the new one. Ucraft – is a drag-and-drop website builder, which works great for entrepreneurs willing to launch a decent website on Mac. The system lets you present products/services to the advantage, offering a variety of web design tools, responsive templates and advanced design customization options. • Free logo maker – Yes. The website builder is known for its powerful eCommerce engine, which comes with dozens of payment options, tax and shipping parameters, niche-specific responsive templates and integration with world-known marketplaces. The platform also offers a multilingual tool, the use of which lets you create and manage several language versions of your website. A set of design tools makes it possible to customize your website, making it stand out from the crowd. Apart from that, the system has an Articles App, which lets you design and manage blogs, portals and news websites. Professional web designers and entrepreneurs can make use of the White Label solution the system offers for effective business promotion. Cost: Ucraft allows launching free landing pages. The rest of the subscriptions are paid and their cost ranges from $8 and up to $76 per month. It’s possible to test any of the plans you are interested in for free during the 14-days trial period. Mobirise – is a free downloadable software you should initially install on your Mac prior to starting working on your website development. The system is built with user convenience and simplicity in mind and it doesn’t require any web design skills or expertise to be effectively used by newbies. • Free hosting – Yes. The website builder comes with a block-based structure, which makes it possible to design websites out of ready-made content blocks. Their overall number currently exceeds 800 items and it steadily keeps growing. Arranging and customizing the blocks is simple and allows creating the required website structure. Websites launched with Mobirise are responsive by default. Mobirise comes with integrated AMP website builder, which lets you launch and manage projects that are perfectly optimized for mobile browsing and ensure quick downloading of web pages. Mobirise design customization tools come out-of-the-box. They make it simple to adjust the major website parameters, style, integrate multiple media files and perform other actions. The website builder doesn’t have integrated hosting, but it makes it possible to host your ready-made project with GitHub pages for free. Cost: Mobirise is an absolutely free website software, but you’ll have to pay for website hosting, domain name and integrations. There is also Premium Pack that comes with paid extensions as well as all-in-one kit, where you can choose between extra plugins and themes. The cost of the Premium Kit constitutes $129. The major problem of building websites with Mac was the absence of decent software. Website builders can be a great substitute to Mac software, covering a broad range of web design needs and providing powerful feature set needed to create and manage a full-fledged project. Wix is the best website builder for Mac, the highlights of which encompass ease of use, extensive feature set, powerful design customization options, abundance of mobile-ready templates, blogging and eCommerce options as well as helpful customer support service. uKit is an affordable small business website builder, which is a cost-effective, flexible and affordable solution for Mac users willing to design quality websites with no hassle and serious investment of time, effort and budget. 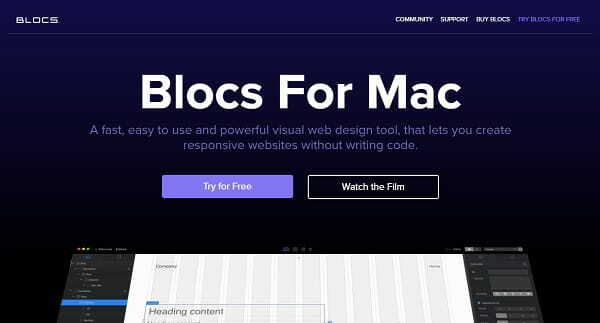 Blocs is a specialized Mac website builder, which comes with a block and bricks structure and works well for creating landing pages, business websites, portfolios and promo sites with limited number of pages. Ucraft is a powerful drag-and-drop website builder, which provides an extensive range of designer tools, responsive niche templates, landing page and logo creator as well as eCommerce and blogging options. Compatible with Mac computers. Mobirise is a free downloadable web building software, which offers an abundance of high end design customization options, block-based structure and other tools newbies and web design pros need to create quality projects for personal and business application. If you are searching for a quality Mac software, website builders reviewed above may prove to be the best solution. Choosing one of them may be a challenge, if you’ve never worked with these systems before. Thus, it makes sense to test each service in advance to select the one, which really works best for your project.